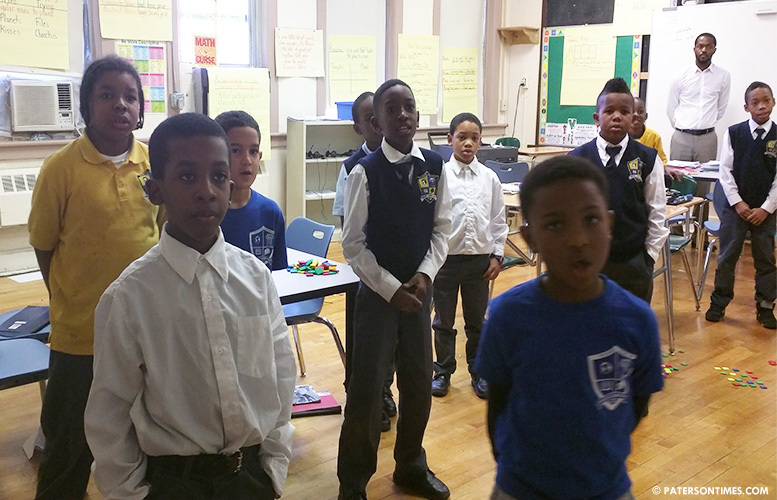 The Young Men’s Leadership Academy created three years ago to improve the academic lot of Hispanic and black boys has fallen short on its mission prompting some to blame poor planning and execution that led to the premature launch of the school. School board members received a report on the academy last week. In her presentation to the board, assistant superintendent Cicely Warren outlined the challenges the school has faced and overcome since it was launched in the 2015-16 school year. “There are some areas where the school is improving,” said Warren. “Some areas where there is a concern.” Her report showed NJ Ask science score for fourth graders has gone up. 77-percent of students scored proficient or higher in 2016-17 school year. She said this is higher than the district average. The boys did poorly on the Partnership for Assessment of Readiness for College and Careers (PARCC) exams. In the English section just 7-percent of the boys met or exceeded expectations in 2017, down from 10 the previous year; in math just 5-percent met or exceeded expectations, up from 2 the previous year. The academy was grouped with the lowest performing five-percent of schools in low-income areas in New Jersey. It was designated a school in need of “comprehensive” support and improvement last month, according to the New Jersey Department of Education. Warren pointed out the school which has 53 students in grades 3-7 has a low rate of chronic absenteeism. Her report looked at the past three years and the problems the school has had to deal with. For example, in the first year, the school’s founding principal and a person in charge of culture and climate resigned to take jobs outside the district. There was also an open enrollment in year one that allowed principals at other schools to send their most troubled students to the academy. “One of the other challenges we encountered was a varying degree of buy-in from students, staff, and parents,” said Warren. In the second year, the school, due to budget cuts, had to let go of key support staff. Three days of guidance support was provided by two counselors. This year also saw the assigning of a professor in residence, revision of admission process to turn it into a “choice” school, and mandatory parent meetings. The school was relocated to Prospect Park from downtown Paterson. In the third year, the school implemented a student-parent contract and intervention during and after school. The school has had to deal with instability in location and staff. School board member Kenneth Simmons, who was part of the committee that created the school, asked whether there is a way to keep the same teachers and staff at the school for a few years. Teachers at the school receive specialized training to educate boys. “If we’re going to invest in that type of training, is there a way to contract to make sure that staff stays here, a year or two?” asked Simmons. Superintendent Eileen Shafer said her staff will look to include a contract stipulation to potentially halt high staff turnover. “Too much turnover is just really not good and that’s what happened here,” said Shafer. Simmons asked whether the admission process includes an interview with the parents and their children to ensure the school is a right fit for the pupil. He said this was part of the original vision for the school. Warren said that was added in the second year. School board member Jonathan Hodges called it a “classic example” of a planning failure. Board members Manny Martinez and Flavio Rivera said the district is spending twice as much on a student at the Young Men’s Leadership Academy compared to other schools. Rivera said the district needs to put together a timeline to make assessments of new programs. “We need to determine when to let things go. We continue to feed programs that are not effective. We need to sometimes make tough decisions even if people get upset,” said Rivera. The school was created to find a way to educate black and Hispanic boys. Both groups are at the bottom of academic performance. These disparities existed for years, said Warren, if the district does not build an effective program and tackle the root causes of it, both groups will continue to lag behind. Simmons said the school was launched a year in advance which created some of the execution failures. He suggested freezing the yearly grade expansion so that no new grade levels are added. The superintendent said her staff will prepare options for the school board’s consideration. “This academy never had a fair shot,” said board member Nakima Redmon. She said it is only recovering from the perception that it was a “dumping ground” for troubled students. Castillo requested the report four months ago to see if the academy was “working” when the district sought to enter into a lease agreement for a building on Broadway to house the academy. The lease for the Prospect Park building ends in June. “I know, from being part of many things that were firsts, that we were going to have some bumps because that’s what happens. My chest hurts. It’s not the right thing to do, to say, that we’re going to look at these children as numbers,” said Talena Queen, whose 11-year-old son attends the school. Queen enrolled her son in year one. Her son is eager to attend the school, she said. She said the school board demands much from the school’s students, teachers, and parents. “Your commitment wavers. Your commitment wavers every year,” Queen told the school board. While Governor Christie was doing his best to starve us, Dr. Evans used to love blaming high-quality staff leaving Paterson solely on salary. That was an easy cop out, akin to throwing up your hands and saying, "I can't do anything about it." Well, like most things, Dr. Evans was very wrong on this topic as well. Mr. Simmons, you are losing good staff, you have constant high turnover, not for reasons of salary, but for reasons of sanity. You are losing good staff because they are treated indifferently at best, with many likely to tell you 'horribly' is a better description. And this is far from a new development. I personally witnessed Paterson Public Schools grow into a bureaucratic nightmare during Dr. Evans' tenure. From the chaotic, life-ruining 2010 layoffs, to frequent mass transfers breaking up school communities, to the utter disrespect shown during years of contract negotiations, to a lack of true leadership from administration including an utter lack of communication, a schism grew between Paterson Public Schools and the staff. For years, no one attempted to heal that rift, and as a result it has only grown wider. And, unfortunately, though she is off to a truly excellent start, Superintendent Shafer can't undo the damage that was done in just a few years, let alone a few months. And she can't do it alone. Mr. Simmons, you have a large number of excellent staff in Paterson Public Schools, who every day fight for the future of Paterson's children. People that I watch and am in awe of their talent and selfless dedication. You also have a large number of excellent administrators, supervisors, and central office staff. But, right now and for a long time, the overall relationship has been damaged. The respect has been lacking and the care has been missing. These days, will find very few staff that can honestly answer the question, "Are you happy in Paterson?" with a "Yes." Mr. Simmons, if you want to reduce staff turnover, if you want to ensure that high-quality, well-trained, motivated staff are in place, and stay in place, then focus on improving their treatment. Demand that Paterson Public Schools becomes a great organization to work for. That it shows the same respect for staff that it would expect them to show students. Because, until that becomes a reality, until that is the foundation of at all, every plan will be a “classic example” of a planning failure. Paterson used to have an all boys school that was fantastic. It had a 98% graduation rate with 95% attending college. It was called Don Bosco Tech. Instead of copying what DBT did, the BOE tried to reshape the wheel. Many of the BOE members and Donnie Evans are in the charter schools pocket so they create a failing system on purpose in order to justify the charters expansion.